This lovable little dog is among the smallest of the working terriers. It has a short, strong, sturdy body with strongly boned legs and a fox-like muzzle with large solid teeth. The eyes are dark and expressive and the ears are upright. The tail is docked by half. 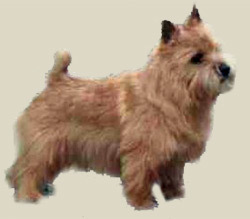 Their coats are wiry and straight and come in red, wheaten, tan, black & tan, and grizzle - occasionally with white markings. The faces sport jaunty whiskers and eyebrows. The Norwich terrier, like the Norfolk, is a true terrier at heart, always ready for adventure and excitement. It is a hunter and may chase small animals. It is a pert, independent, amusing ? but sometimes challenging ? companion, best suited for people with a sense of adventure and humor.